Conventional wisdom dictates that a reciprocating internal combustion engine, such as is fitted to most cars and bikes patrolling the roads of the world, should have round pistons - not square, oblong, or oval ones. Since such an engine derives its power from compression (of the fuel/air mixture), sealing the edges of the piston in the bore to achieve this is vital, and can best be achieved with two or three circular piston rings slotted into the circumference of a round piston. QED. However, conventional wisdom is not something that has often troubled the engineers of Honda's motorcycle racing division HRC. This was achieved through the first-ever use of oval pistons, each fitted with twin conrods, no fewer than eight valves per cylinder, arranged in two rows of four, and twin gear-driven overhead camshafts. The secret was obviously in the design of the piston rings used to seal the corners of the piston, but naturally whenever the engine was viewed in public, Honda carefully hid the rings from view. They probably had some kind of spring-loaded seal, but that can only be conjecture. Running at astronomical revs of up to 22 000 rpm, the NR500 was an ultra-sophisticated but ultimately unsuccessful motorcycle: to achieve their coveted first-ever victory in the World 500 cc Championship for riders, Honda had to join everyone else in building a two-stroke - the unusual but this time successful V3 NS500. However, Honda always claimed that the lessons learnt in the course of the NR project were invaluable, and that a design of an oval-piston bike engine could still be perfected. By now, too, Takeo Fukui had risen through the ranks to become one of the top men in HRC, and was still eager to prove the NR's validity. Accordingly, in 1983/84. 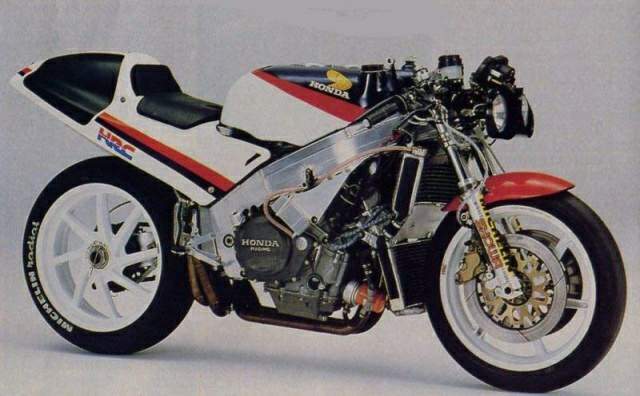 Honda developed a 250 cc V-twin turbocharged GP engine, based on the NR concept, with eight valves per cylinder and oval pistons - but this had not been seen in public at the time of writing. 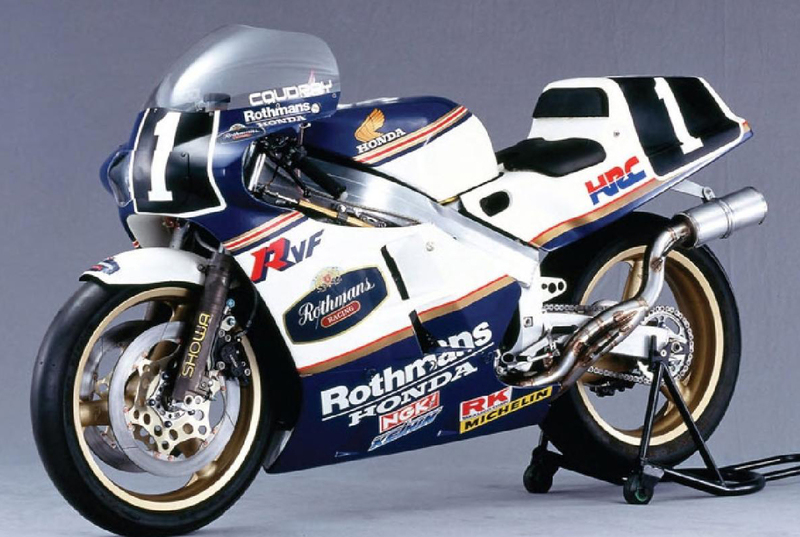 This in turn led to the NR750, a normally aspirated 750 cc engine, still with twin conrods, oval pistons, and 32 valves, which made its surprise debut in the 1987 Le Mans 24-hour event, where it qualified second fastest in practice thanks to the skills of Australian Malcolm Campbell, who was riding it in rotation with a pair of journalists. In the race, the Honda prototype stunned onlookers with its speed, before retiring with, according to HRC, a faulty big-end assembly incorrectly tightened. Producing a phenomenal 165 bhp at 15 500 rpm in 'sprint' form, the new generation oval-piston Honda was detuned slightly for the endurance race. But even so, 155 bhp at 15 000 rpm in a bike scaling only 158 kg with lights and a generator, practically in road-legal trim, guaranteed scintillating performance and seemed to bear out Fukui's insistence that what had begun as a means of circumventing a restrictive set of regulations, in fact turned out almost by accident to offer a significant improvement. The reason probably lies in an inherent limitation of poppet-valve engineering: a four-stroke engine is restricted in the power it can produce only by the amount of mixture you can pack into the cylinder, and the speed at which you can get rid of the unbumt exhaust gases after combustion; in other words, flow, which in turn is dictated by valve area. How big the overall valve size can be in turn depends on piston area, and therefore the bore. Having oval pistons enables more valves to be used, in turn offering greater flow, less reciprocating weight, higher speeds and more power. 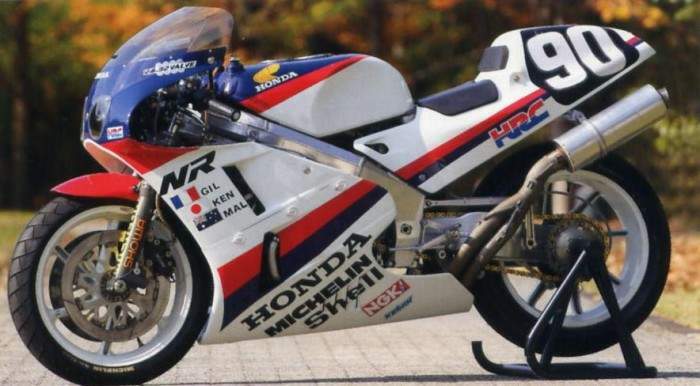 The success of the NR project made it almost certain that an oval-piston road bike would be introduced by Honda before very long - most likely a 250 V-twin, maybe even a turbo! Its launch would give the ultimate justification for Fukui-san's perseverance with a project so many discounted so harshly. 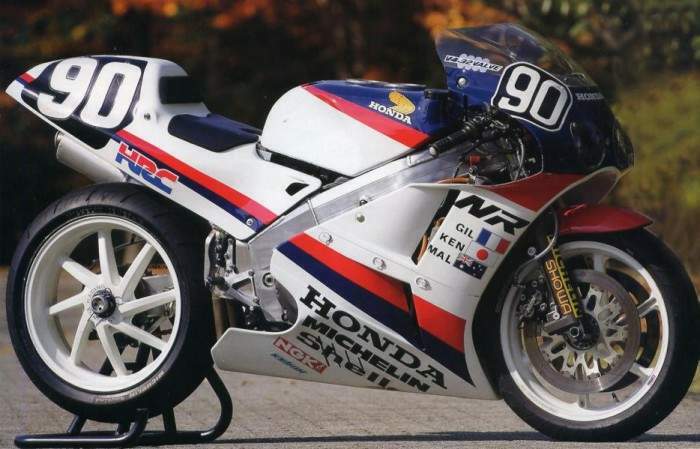 Honda had indeed conquered the World GP with its NS500s, but there were mixed feelings among the project staff. They could not forget the NR500s that had made way for the NS500s as Honda's primary machines in 1982, only to vanish from the World GP in 1983. Oguma sent in a entry with a new machine to compete in the 24 Hours of Le Mans Endurance Race scheduled to be held in July 1987. 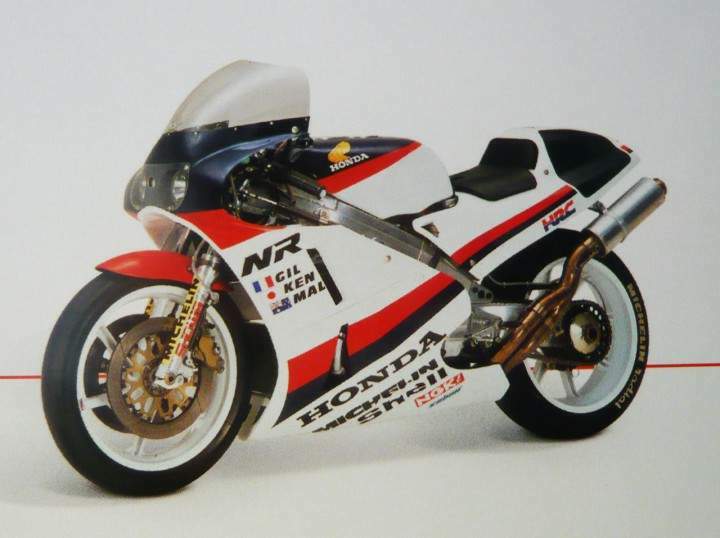 Honda's machine was to be the NR750, an NR with increased displacement. The NR750 fared well in the qualifying round, but retired in the final. However, it won the Swan Series race held in Australia that December, blazing past its rivals in a decisive show of prowess. That race marked the final appearance by an NR series machine. Nine years after Honda first began their development under the goal of winning back the glory of the World GP series, the NRs had ended with a glorious victory. Honda decided to fight for the World GP title with the NR500s, because it looked at the races as nurturing grounds for technology. Although the machines labored for years without a single point, they fostered the talents of numerous engineers and left behind precious assets. Among these were technologies that were later incorporated into production models; bikes that employed many of the weight-reduction techniques their NR ancestors had originated.